Just How Do You Teach A Puppy To Walk To Heel? How can I get my puppy to walk to heel? I use treats to encourage her but whilst we are out she gets very excited and as a result needs a wee even if we've been before we leave the house. Alas she will only wee in our garden at the moment and gets very anxious and 'loses the plot a bit' so starts to pull to get home. I have turned round and changed directions, but she then fights the lead. I end up picking her up (to stop her pulling and carry her home so she can do her wee, figuring that at least she isn't pulling against her lead. For the rest of the walk she is definitely getting the idea of walking to heel, but I am loathe to end on a bad note. I suspect if you can get your puppy to pee outside of the garden, your problem may be solved. Try waiting until you know she wants to go outside, in the garden, and then carry her out of the garden (attached to her lead, of course) and place her on the ground just outside of your garden gate. She may become so desperate that she pees straight away. Practice this indoors first, after some exercise and/or play so that she's a little tired and less likely to 'play up'! Place your puppy on her lead. Take a handful of tasty training treats and put them in your pocket. Take one in your hand (which should be down by your side) and let your puppy see it to lure her to follow you. Start walking, if she's to your right, put your right foot forward (if she's to your left, begin walking with your left foot). This will be her cue to follow you. Say her name as you move off and she'll probably follow you, or should I say, follow the treat. If she walks to heel for a little way, reward her with a treat but don't stop to do it - reward her in mid flow, and say 'good heel'. turn immediately and call her name, but don't allow the lead to go tight otherwise she'll automatically pull on it. It's easier if you have a long training lead (between 5-6'). Make a loop and hold it in your hand, when your puppy begins to pull, drop the loop, turn and begin walking in the opposite direction - this way the lead won't go taught. Don't forget to call her name so that she turns and follows you. When your puppy begins to get ahead of you or pulls on the lead, stop walking and look straight ahead. Your puppy may look at you and wonder what's happening. Ask her to come back to you and sit. If she doesn't, gently pull her back to you. As soon as she's sitting quietly, start walking again and praise him if she follows you. If she pulls ahead again, stop and continue repeating this exercise - praising her when she gets it right. Make sure you keep the leash slack enough when she's walking by your side. 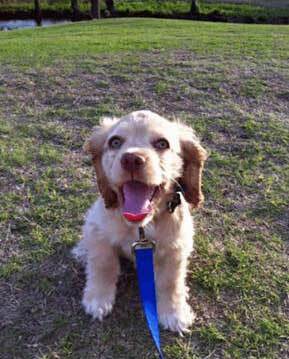 If you hold the leash tight it will make it more difficult for your puppy to learn to walk 'nicely'. Don't punish your puppy if she doesn't get it right first time. If you're consistent and patient your puppy will soon learn what you want from her. Ha! My puppy is just the same. Unfortunately, I have no idea what to do and no suggestions for you - I just wanted to let you know that you're not alone. I will watch this post to see if anyone comes up with an answer. Perseverance is the key! Just keep at it and she'll eventually get the message. If you pick her up each time she pulls against the lead, or fights with it, she'll learn that she can get picked up and eventually gets her own way. Some dogs will only pee on grass and won't pee on concrete or paving. If she pees on grass in your garden, are you taking her for a walk on grass outside? Have you tried teaching her to walk to heel in the house and/or the garden? You might have more luck with that and eventually you would be able to extend this to outside the garden.